Hey, your texture pack looks sick. I downloaded it and opened it but it opened as the default texture pack. I have optifine installed and i use several other HD (32x32 and 64x64) texture packs. I can't figure the problem out. Do you know what going on? Badass texture pack, good job. One of the better simplistic packs I have seen. The workbench is really lovely. Thanks! After seeing the results of the poll, I'll do cracked water, possibly will release an alt. Also, the full release is still quite a long way away but I'll be busy for this week or so; thus, less textures done. Worked the problem out, there was a folder inside the zipped folder which minecraft didn't recognise. All i had to do was take the contents of the folder and put it into the zipped folder. Also, is there supposed to be any difference in the menu look and the weapons? Anyways, I don't think making chests would be hard, seeing that on the main post it showed it as not textured... I mean just a bunch of wood plank textured pixels (copying and paste saves some time) and to be honest, the oak wooden planks should be a tiny bit darker. Thanks! The chests aren't done yet as I want to try and focus in the terrain.png first. 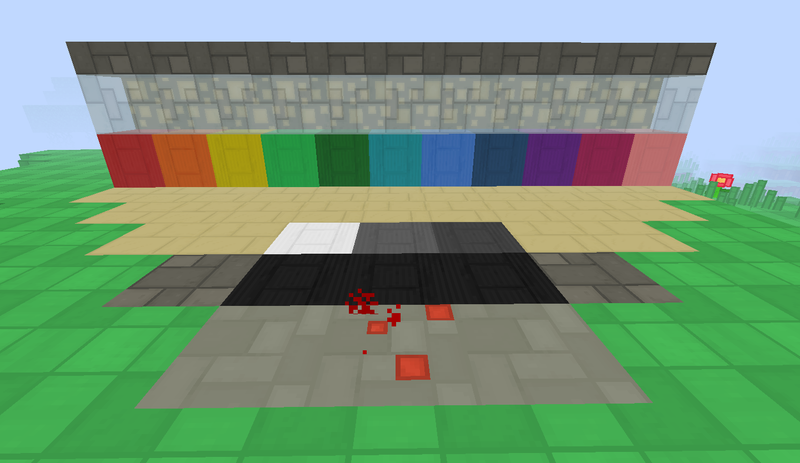 New update will include wool, ice, new cobble and tweaked stone and ores. Ok. Here's a small preview of the upcoming update: Scope, 033. Yay for my new naming scheme. I identify the largest update; wools, mobs, items, tools etc. and then name it after it. Code names. I like the ice, sandstone ( I think ) and sugar cane but I HATE the wool. It's not cubic. Try checkered or lines. I like the fact cobble has a unique texture now too! Thanks! The new update *might* have new clouds. Be prepared to search for the rare, elusive Morning Glory cloud! I like the overall feel - a strong, patterned theme and properly executed at that. However, with that in mind, you need to avoid inconsistencies in textures, like the note block, mossy/cracked stone bricks or the circle brick. Furthermore, the oak plank looks too washed and desaturated in comparison to the other textures. As a final remark - I didn't test it ingame, but i see some specks on the glass. Are they really there, or is it just the usual odd behavior by IrfanView? Thanks guys but if you read my conversation with steelfeathers or read the text under the terrain.png, you would have found that those bad textures are from another pack. Well derp. Serves me right for only reading the OP. Thanks! Also, I don't think your Minecraft username is deadmau5 mainly due to the fact that... well he's pretty famous. This Pack is very superb. It has a futuristic feeling. It's like a Neon Pack with natural colors.